It never rains...it pours, and as a result the gateway to the horses paddock already resembles a mud bath...and it's only November, therefore Mud Fever Maintenance has already begun and although last years blog covers the preventative measures I take, I have a new tool in my box; Thermatex Quilted Leg Wraps. I religiously towel dry Oscar's legs once they've been washed down, and although this ensures they're not soaking it doesn't leave them 100% dry, and after doing a lot of homework on the Thermatex Quilted Leg Wraps, I decided they were the next best thing to a horsey hair-dryer and I made it my mission to source a second hand set, just in case they didn't live up to the hefty £64.95 price tag! I found mine on eBay, second hand for around £40, including P&P and although used, they arrived washed and in a good condition and I have been excited to try them out ever since...and by gosh I didn't have to wait long - mud, glorious mud! I have been using the Thermatex Quilted Leg Wraps regularly for over a month, they're always applied to clean, damp legs and they're designed to "dry off legs, provide warmth and protection for your horse in the stable" they're made from Thermatex' technologically advanced wicking fabric, comprising of woollen inner and outer layers knitted together with a middle insulation of polypropylene. 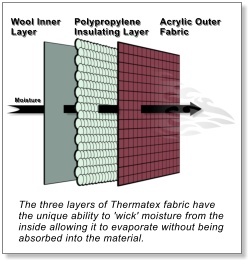 The wool and yarns used are of the highest quality and are spun specifically for Thermatex - and even though my wraps are second hand, the quality is exceptional. 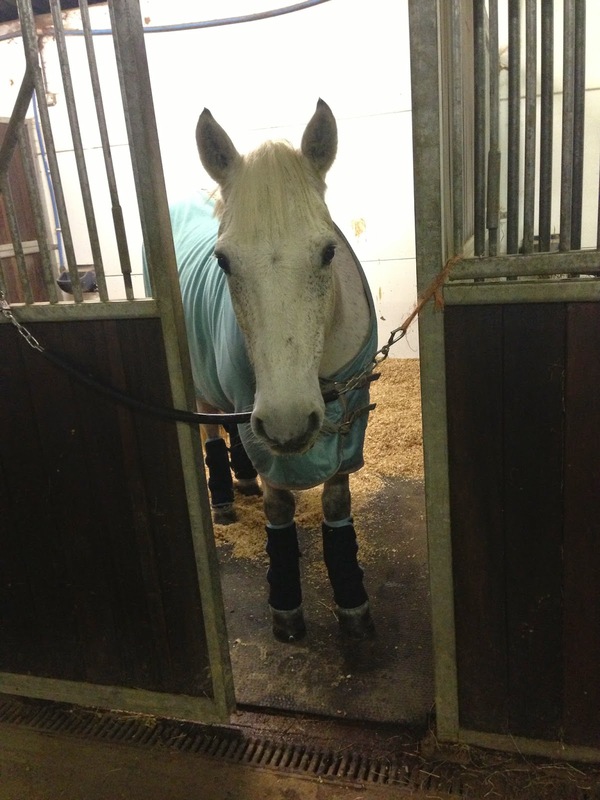 The wraps are light to handle, warm and comfortable and Oscar doesn't even walk funny in them! Their unique ability to wick moisture from the inside of the fabric is second to none, it allows moisture to evaporate into the atmosphere without being absorbed into the fabric and after applying to towel dried legs it only takes 20 minutes for Oscar's legs to be completely dry after wearing his wraps. The first time I was astounded, the wraps were slightly damp but his legs were dry, moisture free and toasty warm and I've put them to the test again and again, every time they put a smile on my face! 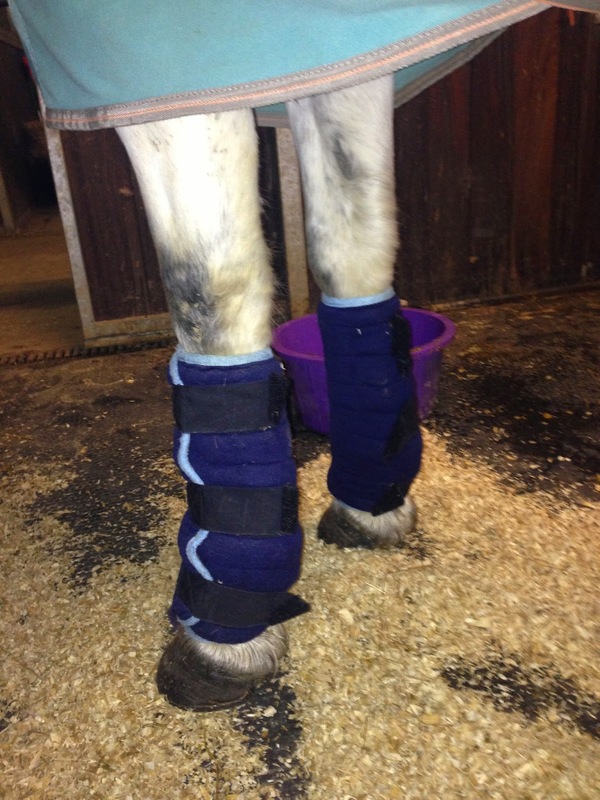 My Thermatex Quilted Leg Wraps are a size large (to fit any horse 46 x 41cm) and at first I did find them a little too long to wrap and velcro in place, with the velcro tabs over reaching the velcro slightly on Oscar's tiny pony legs, but I soon mastered the art - however I still don't feel confident leaving them on overnight in case they slipped down his leg and he hurt himself by kicking to get it off - therefore if I purchased a brand new set I would consider a size smaller for Oscar, and that is something I would definitely consider, at £64.95 they're worth every penny, I consider mine a serious bargain - thank you eBay! - and if you're really in the money, the Courda design prevents straw, hay and shavings from sticking to the wraps (convenient) and is a stronger material, costing £83.95.